Elizabeth Todd joined the Trinity team from her hometown of Griffin GA. She spent almost ten years in the classroom as a high school Business Education teacher with a Special Education endorsement. Receiving her Therapeutic Riding Instructor certification and Equine Specialist for Mental Health and Learning for PATH International thru the High Hopes training program in CT. Elizabeth has an extensive background in multiple disciplines, english, western, gaming and therapy. Elizabeth is a long time member of AQHA. She brings with her over 40 years of practical horse experience as well as formal training in TR and EAP. She is the mother of 3 children and 3 grandchildren. Proverbs 21:31 The horse is made ready for the day of battle, but victory rests with the LORD. Our program provides structured horseback riding sessions to children and adults with varying physical, cognitive, and emotional disabilities. Our brain is constantly communicating with our body. It’s constantly assessing its surroundings, making adjustments and compensating to keep us safe and comfortable. Sometimes through injury or illness, the pathways in charge of these tasks become impaired or changed, altering a person’s abilities. 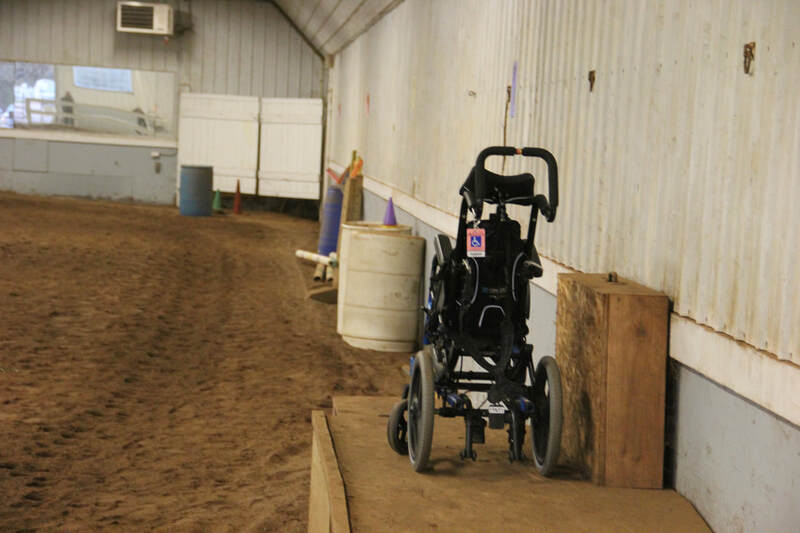 But there are great benefits and many improvements that can be realized by Therapeutic Riding. Amazingly, the walking gait of a horse most closely resembles that of a human. When a person with disabilities rides a horse, that rocking rhythm begins to exercise those pathways and the body begins to respond. Muscles begin to relax and strengthen. Balance and coordination measurably improve. A sense of empowerment and self-confidence is evident. Hope is born and ability is realized. - "I have been coming here for three to four years. I am now healthy due to Trinity. I feel great, and love life. And yes, even Rocky too!" - "A place of pure love! Especially for returning combat veterans." - "My son started last evening with Elizabeth. She was awesome with Kadin. He's so excited to come back in two weeks. This therapy is perfect for our son."